We wanted to create interesting levels in the garden as this gave real interest to what would have been fairly large expanses of lawn. The Alu Excel Edging by Kinley Systems, is the perfect way to achieve this look. The 150mm deep flexible aluminium edging provides a clean edge for lawns and is really quick and easy to install. It doesn’t need to be concreted in and is available in a range of heights from 18 – 150mm. Its flexibility and light weight means that we were able to curve it round the arcs in the design. The shiny, smooth finish gave a really contemporary feel to the garden and tied into our car garden theme. We love the fact that it is made from 100% recycled materials and that it won’t rot or rust. It costs £52.62 + VAT per 2.5m length (in the 150mm profile). 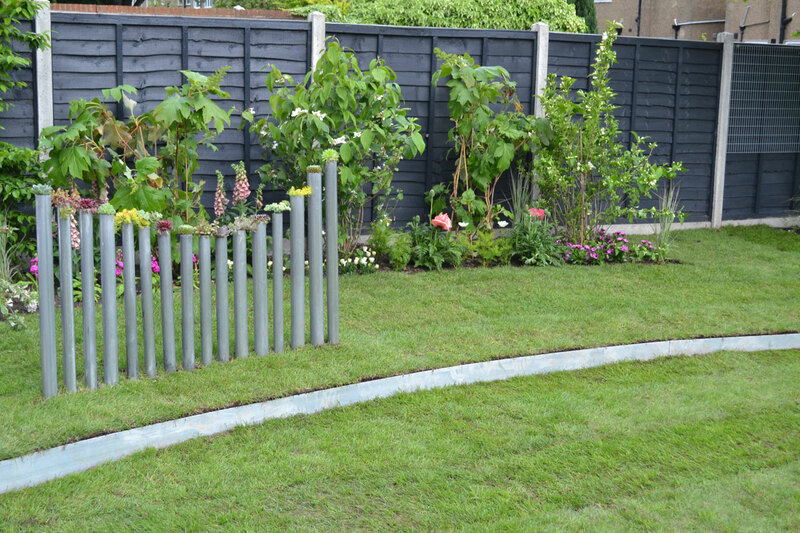 There are a large range of other edging products available in many different finishes to suit whatever your requirements are. 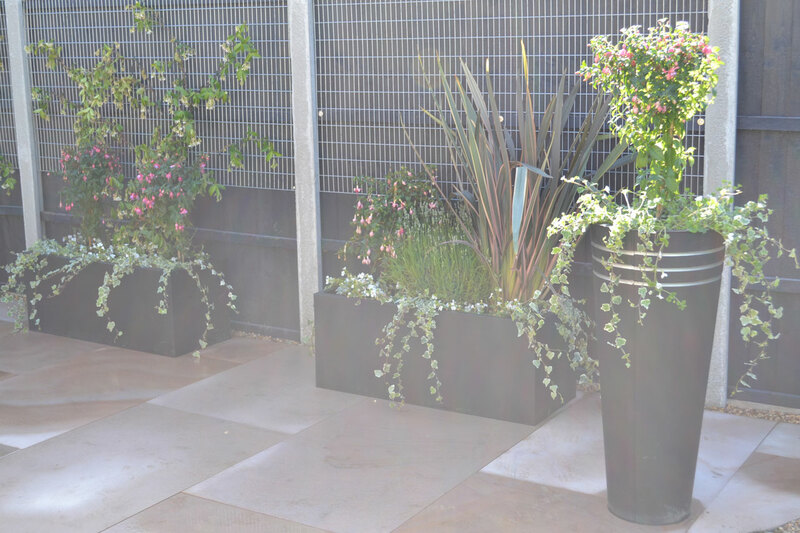 We wanted some stylish and striking planters for the Rendall’s and the zinc planters by Primrose fitted the bill perfectly. The Tall Round Zinc Planter (90cm tall) combines function with design, we loved the striking 3 bands of silver at the top of the planter and it felt distinctively modern, which fitted in with our car garden theme. They gave height and style at the same time in the garden. We also selected matching black zinc trough planters and by placing them around the patio, they really greened up the space. The planters are made from corrosion resistant steel and can be used both indoors or outdoors where it has a high resistance against all weather conditions. They have been manufactured from high quality steel with zinc galvanising. This process adds a coat of zinc to the planter to help improve its resistance against corrosion caused by both the atmosphere and the elements. The planters are very lightweight, meaning that it can be moved with ease and features a central hole in the bottom that will allow for drainage. A bung is supplied to plug the drainage hole if required and it is finished with a simple yet decorative pattern that will enhance any setting in which it is placed. 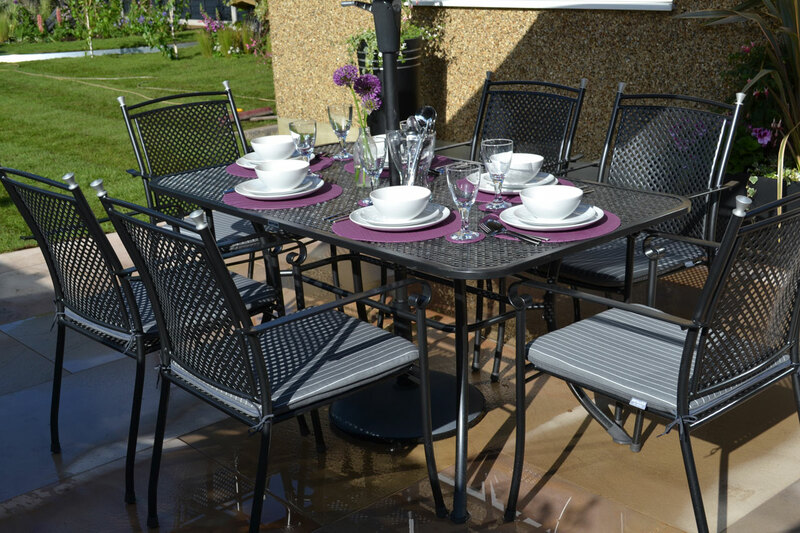 We wanted to feature a dining set in the Rendalls garden which reflected Alan’s love of cars. The Rexia dining set by Kettler (GB) Ltd has a fantastic lattice detail to the top of the table and the backs of the chairs. This reminded us of a car grill and we absolutely had to have it. The table and chairs are made from aluminium & steel and are totally weather-proof. We selected the 160x90cm lattice top table, which offers great value and versatility, it comfortably seats 6 people. There’s a height adjuster on the table for uneven surfaces, a parasol hole and protective footcaps. It’s also available in other with different types of table tops including Mesh, HIP, Infinitree and Weave. The table retails at £449 and the chairs at £99 each. 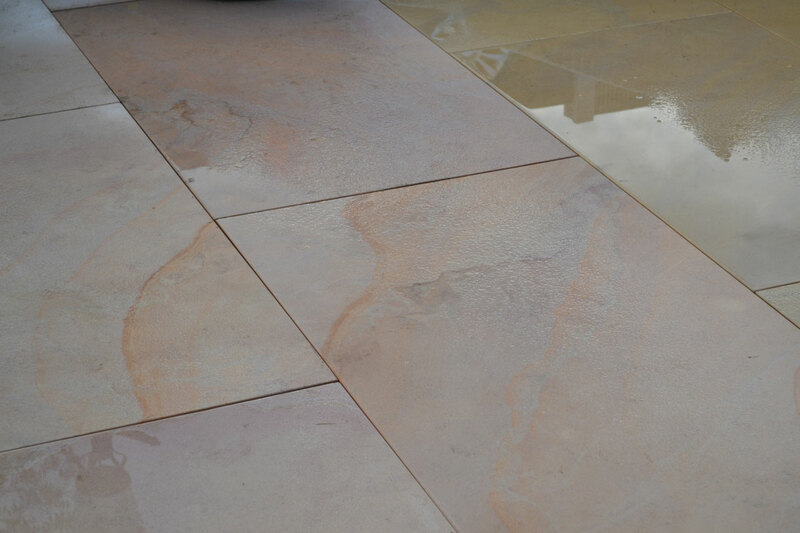 We wanted large paving slabs which would make a real impact in the Rendalls garden and we certainly got the with the Grand Natural Sandstone paving by Bradstone. We selected huge slabs – 1250mm x 750mm and they had the most incredible marbled pattern throughout them. They are beautifully smooth and a perfect choice for our garden. We selected the Caramel colour, but they are also available in Grey Ochre and Imperial White. This paving comes in 4 different sizes: 550 x 750, 750 x 750, 1000 x 750 and 1250 x 750 – great for covering large areas quickly! All of Brastone’s products are ethically sourced and they have a huge range to suit any type of garden. We wanted to give the Rendall’s a comfortable sofa set for their garden which had curves just like the vintage cars and bikes Alan loves. The Honolulu Sofa Set for Homebase is the perfect match and looked amazing on the patio. 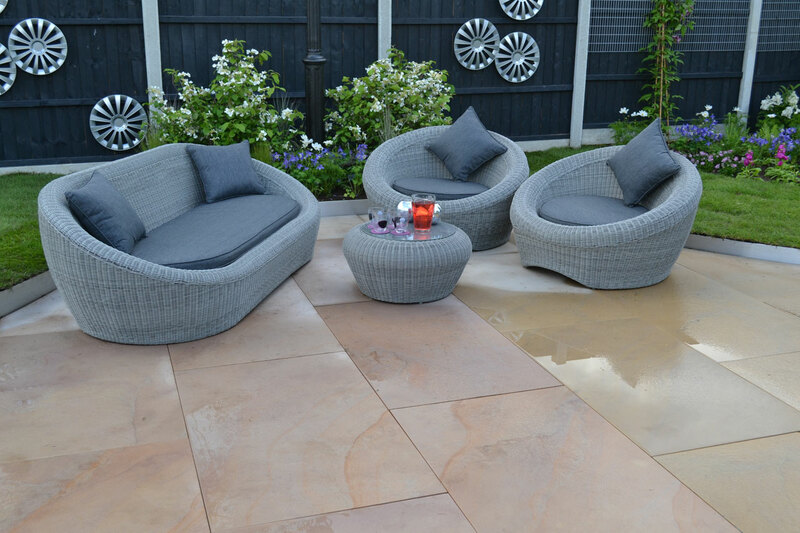 The lovely grey colour matched with the metal features throughout the garden and is incredibly comfortable. Big, bold curves in muted shades combining hand woven rattan with push comfy cushioning – includes 1 round table, 1 sofa and 2 arm chairs. We wanted to give Alan and Rosemary a place to relax in at the far end of the garden which tied into our car theme. 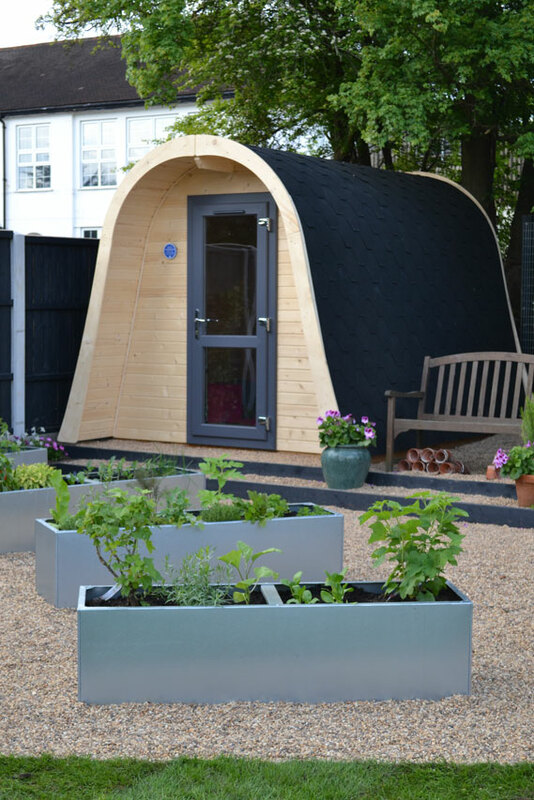 We chose the Man Cave Noir by Dunster House because we think that the beautifully curved roof reminds us of a vintage car and the roof tiles reminded us of tyres or a road surface travelling over the roof of the building! The stylish and innovative man cave brings not only beauty to the Rendall’s garden, but a cosy, yet spacious area for them to get away from everything in. It has a handy window at the back which lets in natural light. Dunster House offers a range of different finishes and sp[ecifications to this amazing garden building – from a choice of roofing coulours and style, to protective paintwork finishes. The windows and doors are fully double glazed!